2018 Deaf Awareness Week spokespersons Jimmy and Trudy Mitchell pose recently on the Oklahoma School for the Deaf campus in Sulphur. Today, he is a Vocational Rehabilitation employment counselor for the deaf. She was recently promoted to OSD dean of students. The Mitchell’s, age 16, are shown at OSD shortly after they met in 1996. Trudy Mitchell, who is hard of hearing, identifies as deaf, and speaks and signs in American Sign Language simultaneously. She was promoted to OSD Dean of Students on August 1, She continues to be the dorm counselor responsible for helping students with behavior issues, at risk problems and curriculum that helps them develop life skills. Jimmy Mitchell is deaf and uses ASL to communicate. He is a DRS Vocational Rehabilitation counselor helping OSD students prepare for employment and independent life through the Transition program. Both OSD and Vocational Rehabilitation are divisions of the Oklahoma Department of Rehabilitation Services. “To me, deaf culture is a way of life,” Jimmy Mitchell said. “ASL -- that is my language now. That’s what I use most of the time. I want to help deaf and hard of hearing students to succeed and get a career in the hearing world. 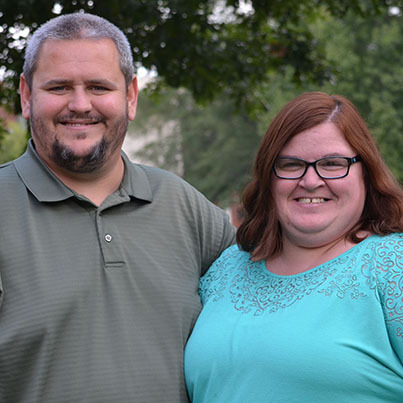 Communication technology, the Mitchell’s say, is rapidly bridging gaps between the deaf and hearing worlds, and improving opportunities for job seekers who are deaf. OSD staff use an internal Cisco phone system with video capabilities. Video phone companies can provide interpreters to communicate between ASL users and hearing people who do not sign. Some have Spanish speakers to translate. Jimmy Mitchell also uses a system called Ubiduo with two connected laptops to help students communicate during job interviews when interpreters are not available. Jimmy Mitchell was born hearing, but became deaf at age 5 after an illness. “The doctors immediately referred me to an audiologist,” he said. “So I got a cochlear implant, but it just didn’t work for me. I was always frustrated…. She graduated from East Center University with a bachelor’s of arts degree in family consumer science and a master’s in Human Resources Administration. Jimmy earned a bachelor’s of arts degree in human resources and master’s of science in human resources/vocational rehabilitation, both from ECU. “Actually today is our anniversary, and we’ve been together for 22 years,” Trudy Mitchell said. For more information about Oklahoma School for the Deaf, contact 888-685-3323 toll free or visit www.osd.k12.ok.us. Oklahoma School for the Deaf is a free deaf education immersion schools for students, pre-kindergarten through 12th-grade, without barriers to communication. Students meet all the graduation requirements mandated for students attending other public schools, but also benefit from specialized instruction and extracurricular activities, including competitive sports, leadership programs and academic team competition. Staff and students communicate directly (without interpreters) using American Sign Language, however, many students utilize cochlear implants or hearing aids. As the statewide resource center on deafness, OSD provides thousands of free outreach services to public school students, the families and educators in their local schools.